The Shops at Georgetown Park; Washington, D.C. The neighborhood of Georgetown is located within Washington, D.C., only a couple miles from the White House, Pentagon, Capitol, National Mall, and all its monuments. Originally a separate city founded in the 1700s, Georgetown’s early residents included big names like Thomas Jefferson and Francis Scott Key, and George Washington also worked here while he acquired land for the country’s new federal city. 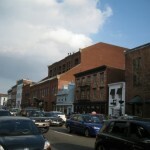 Georgetown is the only significant, established place within Washington that predates it. The modern city of Washington, planned by Pierre L’Enfant in the 1790s and later completed by Andrew Ellicott, actually came later and eventually swallowed Georgetown completely. 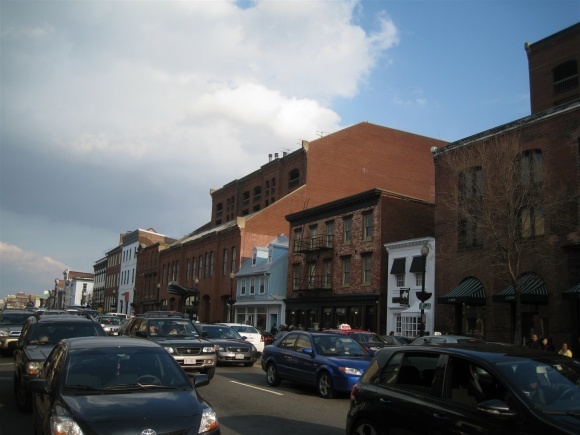 As it was the only actual organic city within Washington, Georgetown has always been a center of culture and commerce, with historicity and legitimacy that Washington originally lacked. Georgetown was officially amalgamated into Washington in 1871, and its streets were renamed to coincide with Washington’s streets in 1880. After a period of decline during the 19th and early 20th centuries, Georgetown rose up once again in the 1920s and 1930s after a series of efforts and a growing Washington put it back on the map. A bridge was built in 1915 along Q Street, connecting Georgetown with the rest of the city, making subsequent development inevitable. 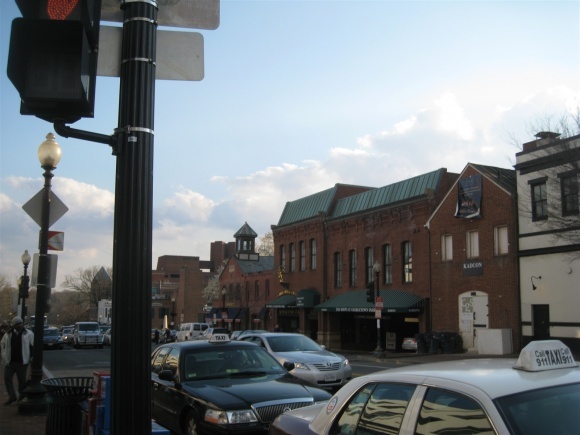 However, smart urban planners quickly began drafting documents and planning policies to make Georgetown a historic preservation district, which was eventually codified into legislation in the 1950s. About the same time, the last vestiges of old school industry that powered Georgetown closed, and there was renewed interest in neighborhood redevelopment. 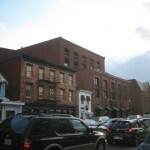 As Georgetown gentrified, it transitioned from a largely African-American and blue-collar demographic to house the Washington white-collar elite. Elite families became interested in the neighborhood’s historical nature, and big names returned to the neighborhood. The John F. Kennedy family moved into the neighborhood in the 1950s while he served as Senator, and by 1960 the area was widely known for its fashionability as a result of Jackie Kennedy’s elaborate and well-publicized parties. 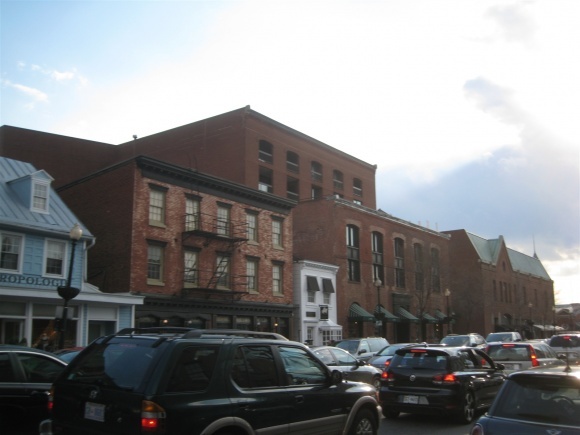 From the 1960s onward, Georgetown has retained this cachet as the most exclusive, upscale neighborhood in all of D.C., and is the best shopping district as well. 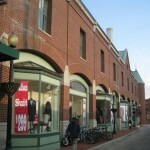 The major retail corridor in Georgetown centers around the corner of M Street and Wisconsin Avenue, with a retail critical mass at this intersection. Today, walking down K Street is a place to see and be seen on weekends, and the roster of stores rivals the better shopping districts of any major world city. 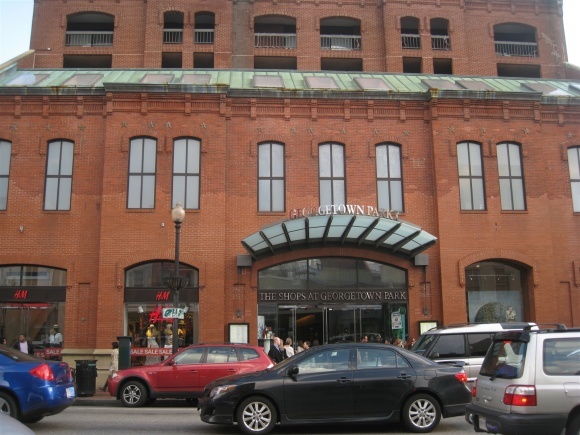 From local boutiques and restaurants to national chains, Georgetown is the by far the best cohesive shopping area in all of D.C.
There’s even a significantly sized mall here – The Shops at Georgetown Park – located directly at the intersection of critical mass at K and Wisconsin. 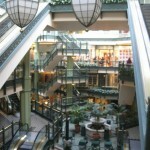 An anchorless mall, The Shops at Georgetown Park was developed in 1975 and opened in 1981 as the planned centerpiece of the Georgetown shopping district. 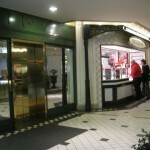 After years of success, in recent years the mall has fallen on hard times and has a nearly 50 percent occupancy rate. 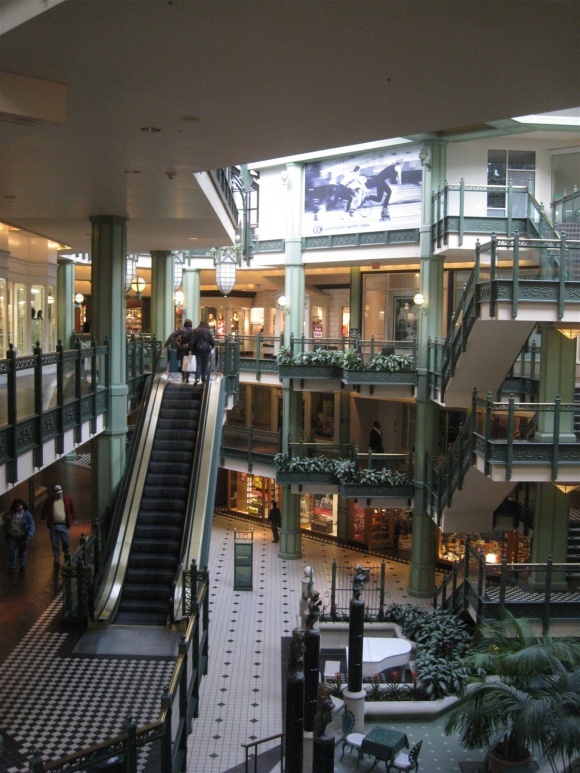 The mall is currently considered a failure, and redevelopment is pending. But how did this happen? How could a retail entity that seemed like a turnkey operation fail, in the middle of the best shopping district in one of the largest and most important cities in the country. 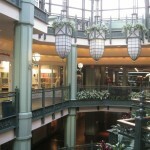 The site where the current mall stands, located in the middle of historic Georgetown, is naturally ripe with history. In the 1830s, the site was a tobacco warehouse which opened directly up onto the Chesapeake and Ohio Canal, located right behind it. Part of the modern structure today includes pieces from this original use. In the 1850s, the site became home to stables for the horses that powered the first horsecar line between Washington and Georgetown. Later, the site was converted into a shop for streetcar maintenance, and became disused after Washington abadnoned its streetcar lines in 1962. Thereafter, the United States Defense Communications used the building for secret-God-knows-what until the 1970s. 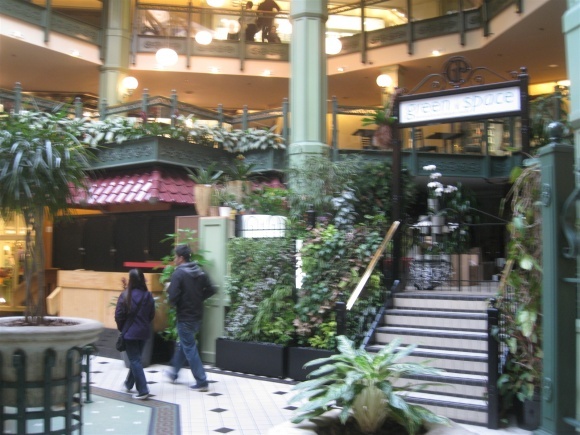 In 1975, Donohoe Construction Company, in partnership with Western Development Corporation, got a hold of the site with plans for a mixed-use retail and condominium project. 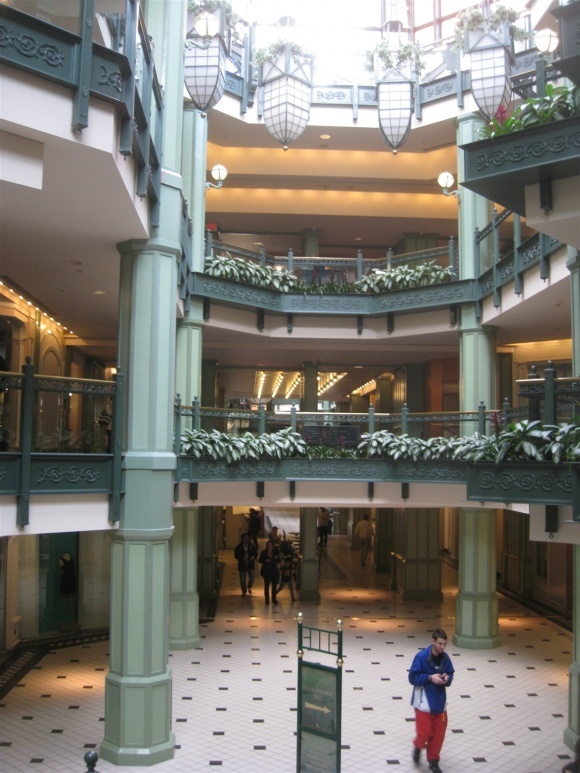 The project was said to be one of the largest on the East Coast at the time, and included preserving the 100-plus year old facade on Wisconsin Avenue, building a 300-space underground parking garage into solid rock, and adding superstructure to the 10-foot thick, 35-foot high wall which was used to build the C&O Canal. 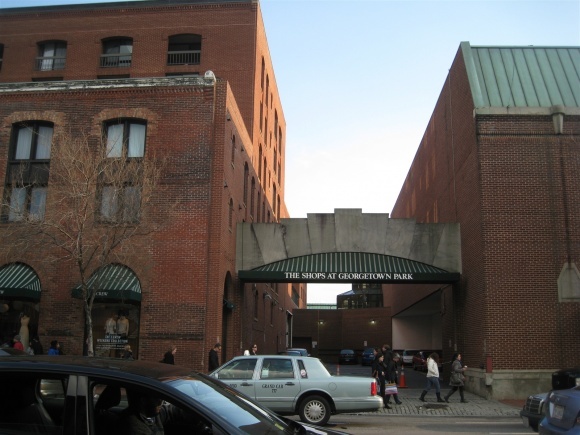 The partnership’s plans went ahead, and phase one of the project, which included a Conran’s home goods store and 35 condominiums above it, opened in 1980. 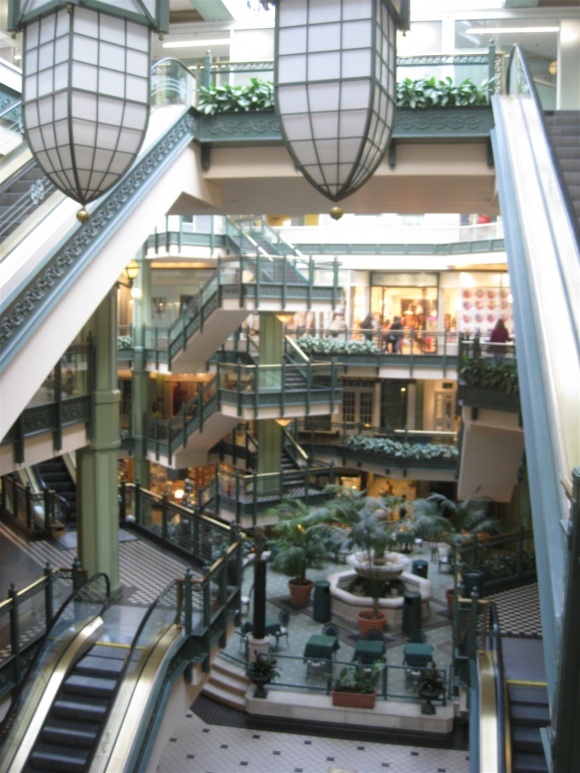 The next year, on September 27, 1981, a 100-store retail mall called The Shops at Georgetown Park opened adjacent to phase one with 128 additional condominiums. 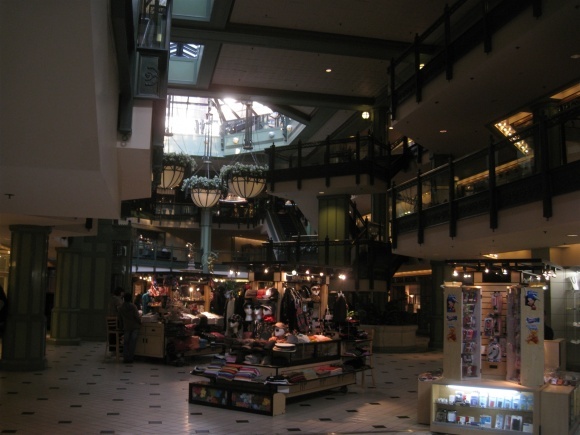 The mall contains three full levels and a mezzanine level, houses a food court in the basement, and is listed at just under 450,000 square-feet of leasable space according to the International Council of Shopping Centers. 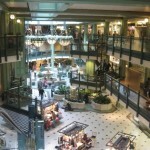 However, a recent article in the Washington Post cites the mall only has 300,000 square-feet of space. Hmmm. 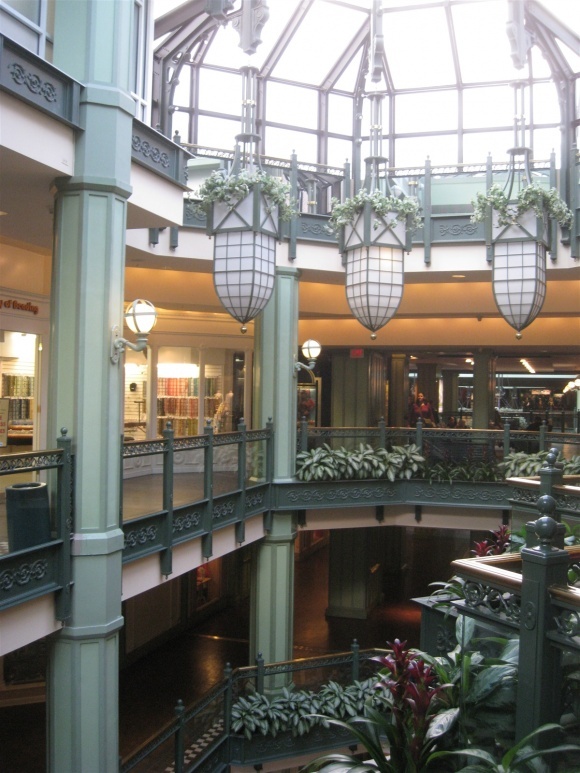 The mall is visually stunning, yet slightly dated, with wood floored hallways, skylights, cast-iron braces, brass and glass elevators, and hand-built oak kiosks. It feels a little darker than it should in there, even during the day. 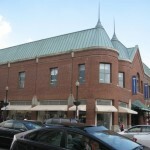 When it opened, the mall housed many upscale national retailers as well as local boutiques, restaurants, and most of the stores were in line with Georgetown’s upscale atmosphere. 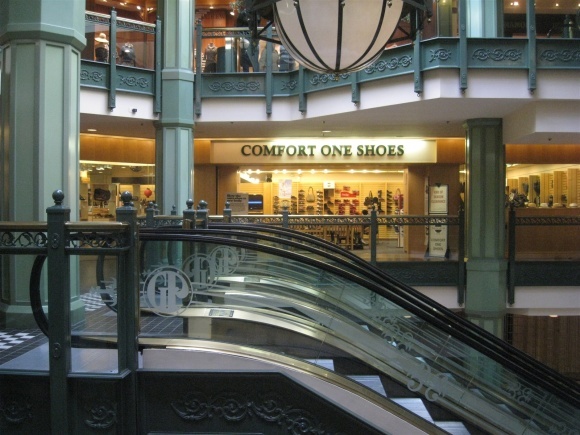 Original stores included the East Coast’s first Abercrombie and Fitch, Godiva, Ann Taylor, and a small branch of D.C.-based Garfinckel’s department store. 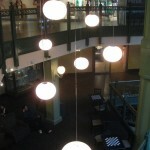 The Shops at Georgetown Park was an instant success. 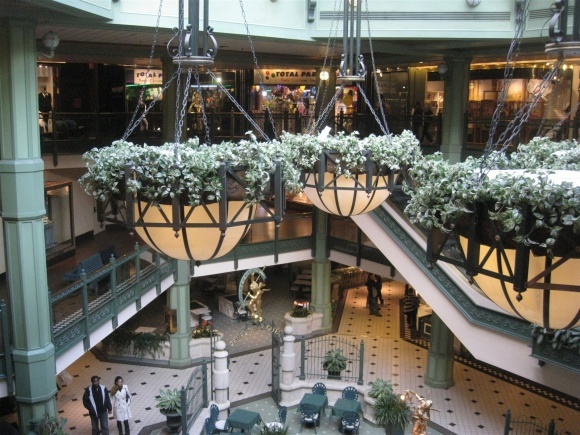 Many people came from all over the D.C. metro area to shop at the mall. 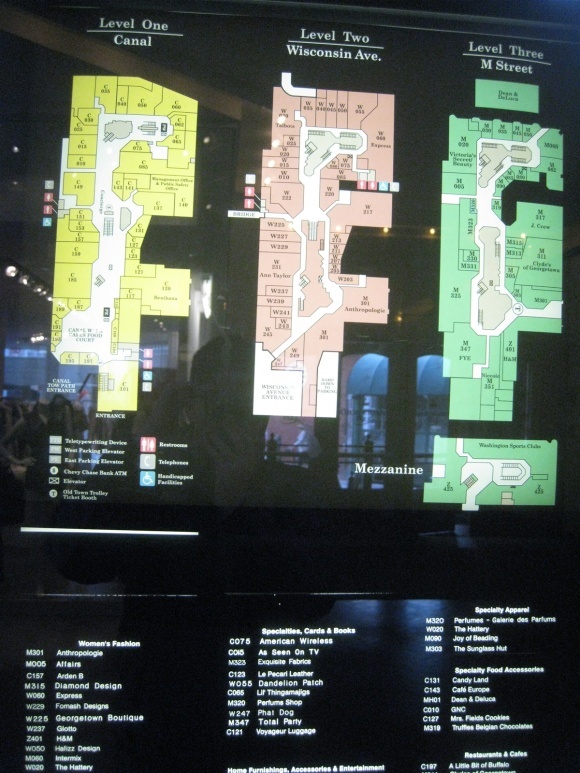 A well designed mall, access was given to all four sides of the mall, to all levels, meaning no part of the three-level mall was a functional dead end. 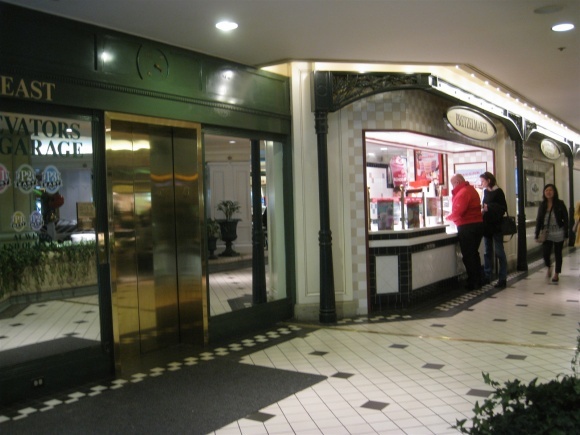 In addition, the stores along M Street, a popular pedestrian corridor with retail boundaries far in excess of the mall’s footprint, were given separate entrances, allowing M Street’s retail corridor to retain cohesion and seamless facade of continuous retail. 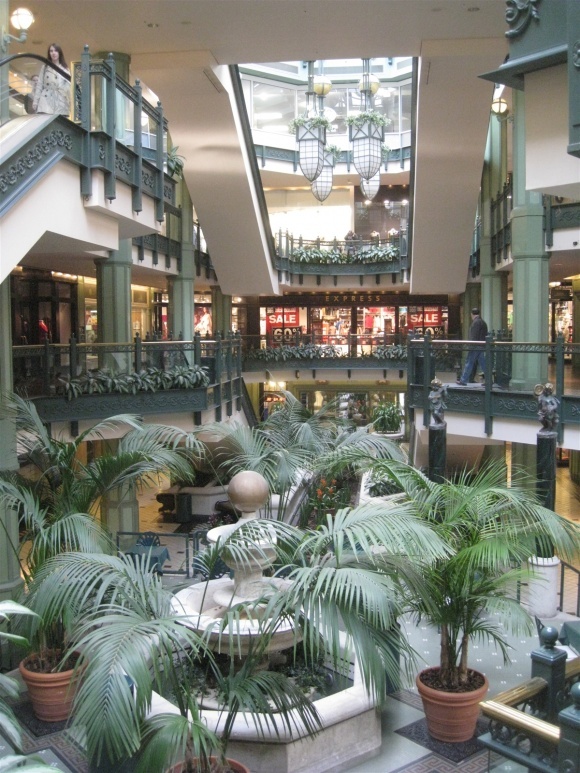 In fact, the mall is almost too camouflaged from the street; its entrances aren’t as grand as at suburban malls. 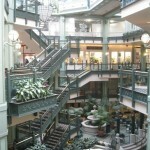 Georgetown Park retained its glory even well into the last decade, the 2000s. 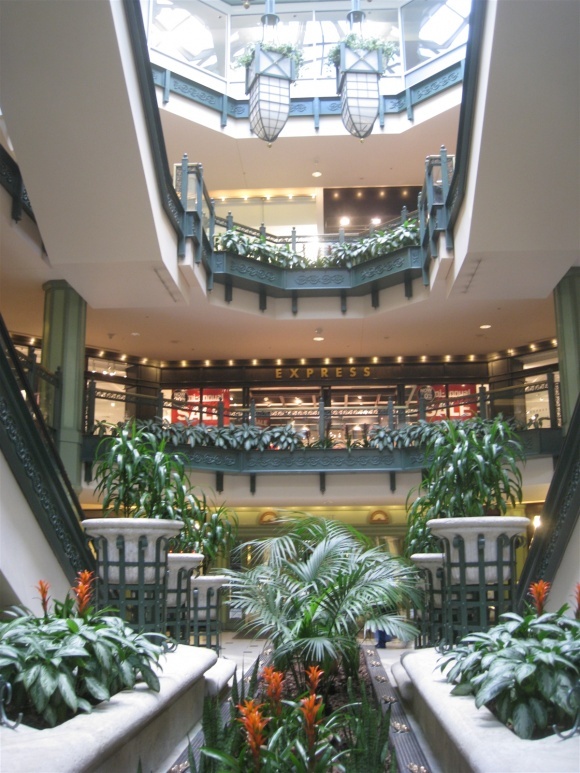 In 1994, it was even featured prominently in the hit movie True Lies, where Arnold Schwarzenegger’s character has a chase scene and an ensuing shootout erupts throughout the mall. 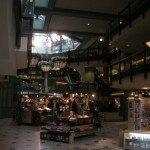 According to web.archive.org, many popular stores were even present at the mall in 2001, including Abercrombie, Aeropostale, Ann Taylor, Casual Corner, Benetton, FAO Schwarz, The Limited, Godiva, Polo, Talbots, Victoria’s Secret, Waldenbooks and Sharper Image. 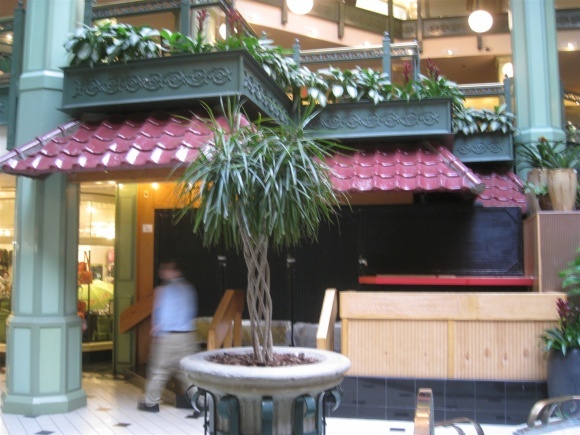 By 2007, many of these were gone, and today only a handful of national stores remain. Many of the stores in Georgetown Park today are local, and the center sports a nearly 50 percent occupancy rate, down drastically from recent years. 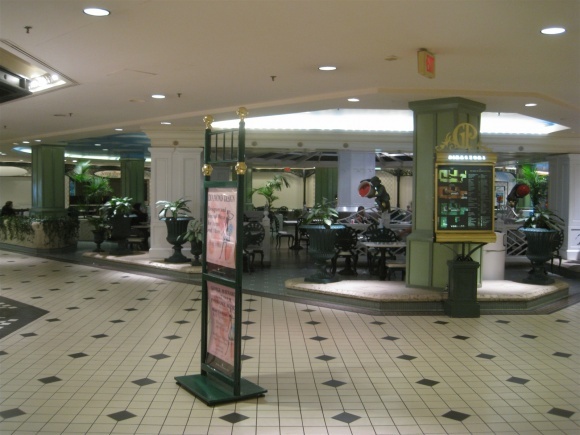 According to a 2010 Washington Post article, the mall was only 10% vacant at the beginning of 2009, and that jumped to 56% by April 2010. This isn’t shocking at all, but Yelpers have even taken notice. 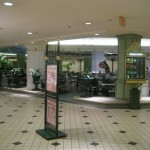 Why did the mall clear out so quickly? The mass exodus is at least partly the result of a squabble between two real estate giants in the area. 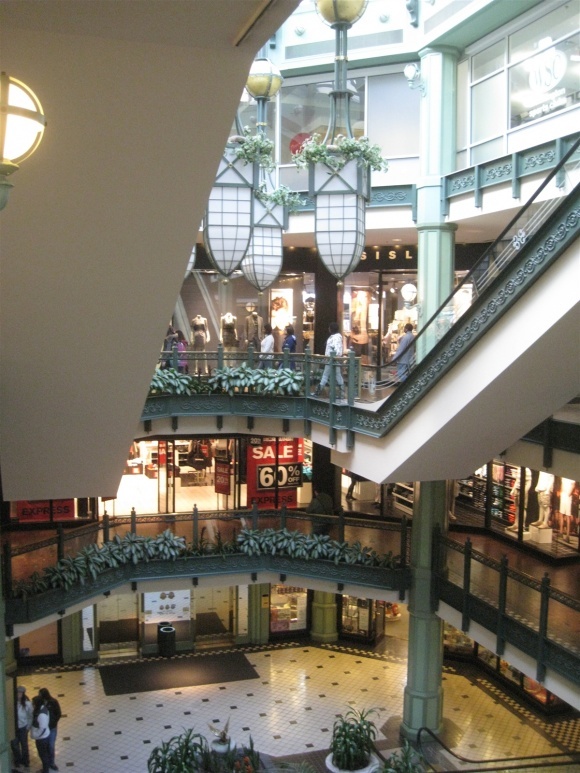 Western Development, who originally helped build the mall, purchased the mall in 2006, and inked a deal for Bloomingdales to come to the mall in 2008. Unfortunately, the economy also collapsed about the same time, and Bloomingdales backed out. 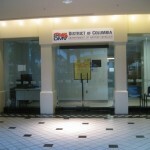 Western defaulted on their loan and the mall went into foreclosure. 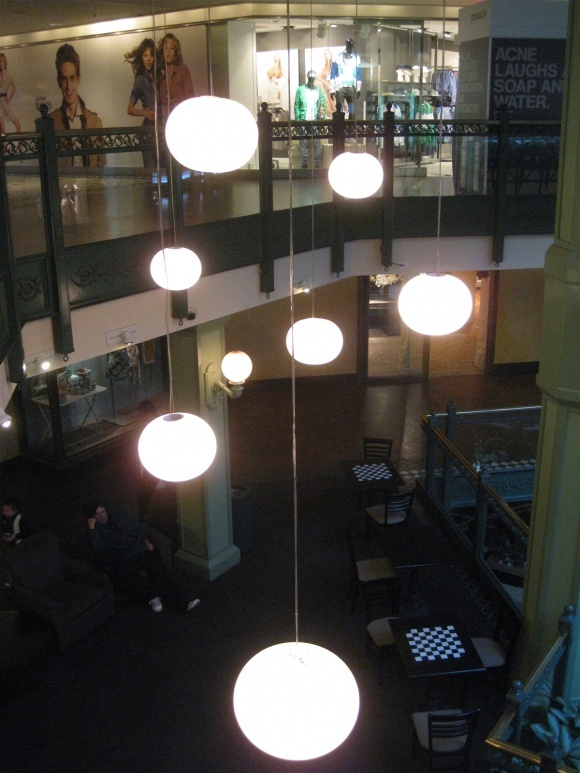 It was eventually sold at auction to a New York firm, with Vornado brought on to manage. Adding another wrench to the situation, Georgetown developer Anthony Lanier also lay legal claim to the mall. 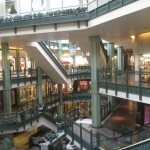 Western said that in claiming a right to the property Lanier prevented the owners from refinancing it for redevelopment or from signing leases with retailers, which caused the mall to empty out. 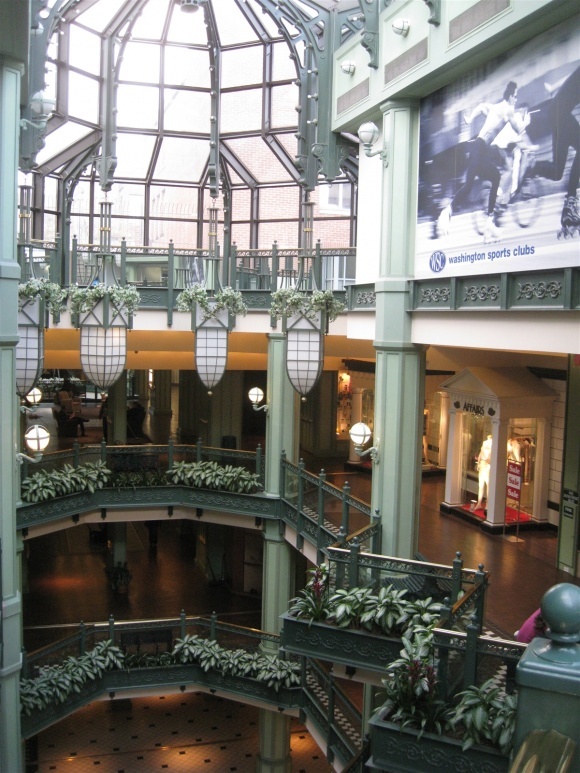 In 2011, renewed interest in the mall has sparked rumors about redevelopment solutions. According to the Georgetown Current, a local paper, both Target and Bloomingdales are indeed coming to the troubled mall. An interesting combination, it will surely spawn debates about the appropriateness of the modification as well as the onerousness task of including these stores without disturbing the local character and charm of Georgetown itself. Also, surely some people feel that Target doesn’t necessarily belong in Georgetown, though others will disagree and say that Target has enough of a hip cachet and vibe to belong here. 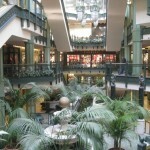 Some even feel that a shopping mall of any scale here is not only unnecessary, it’s bad, and they have a point too. Places like Georgetown don’t really need malls. 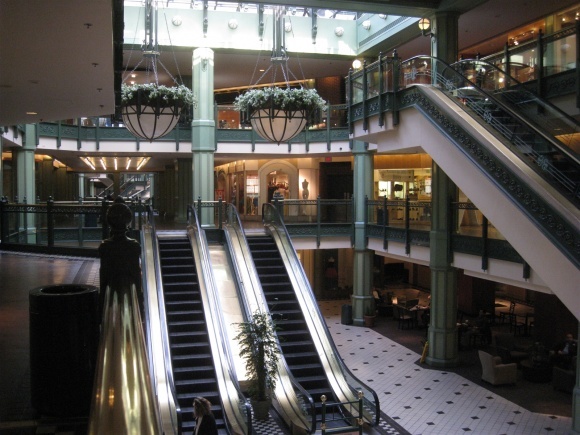 Personally, I feel adding Target and Bloomingdales is forward-thinking for a mall. 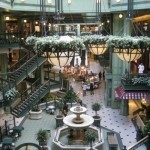 In today’s retail climate malls can’t afford to be universally upscale – or downscale, for that matter. Adding a mix of retailers will get more people in the door, and having the second Target in the District will certainly prove popular here. 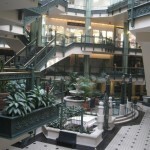 A major question remains, though, regarding the redevelopment rumors: how will the additional anchors stack in the mall? I’ve read that Target will occupy the lower level, where a moribund food court now sits, but what about Bloomies? 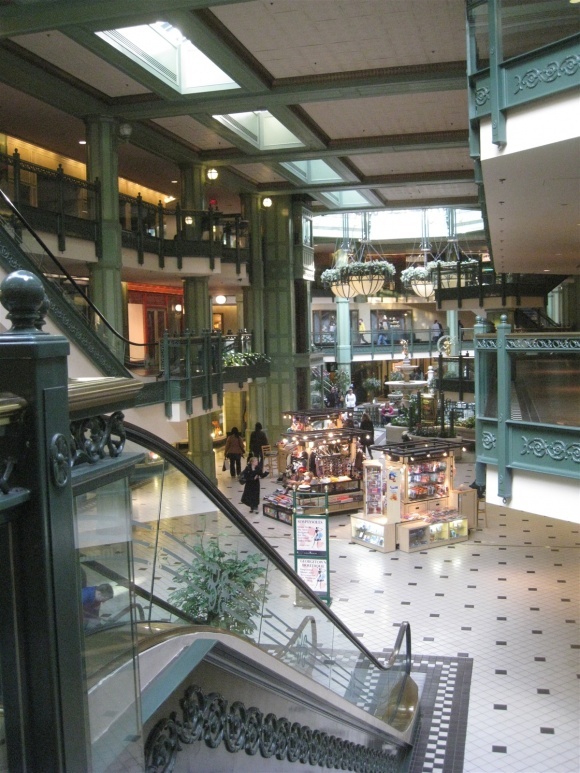 At the very least, half of the mall’s retail space will disappear. What will become of the other half? 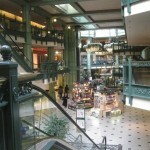 Will it remain an enclosed mall? We’ve visited Georgetown Park a few times in the past 10 years, and have seen the decline first-hand. 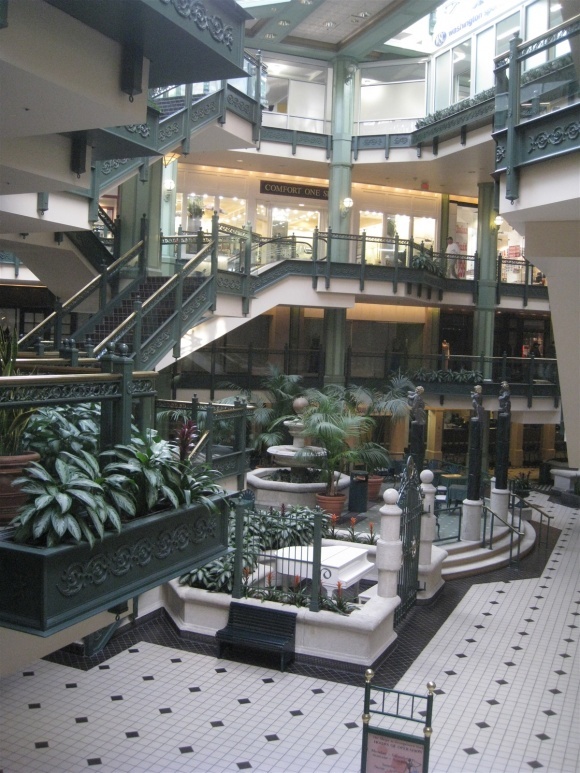 Even a few years ago, the mall seemed to be doing a lot better. It’s kind of interesting that it didn’t die due to consumer preferences, and instead emptied out due to bickering between owners. 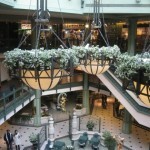 At least now the redevelopment is apparently back on track, and the mall will be rejuvenated with these new anchors. Where to start….Georgetown’s renewal started well into the FDR administration, not the 20s and was very gradual. JFK’s celebrity probably was a minor part of that slow return. There was industry on the waterfront until around 1970. The tannery and the power plant there were rather large impediments to redevelopment. It was considered run down even as it began to attract New Dealers, Fair Dealers, and the New Frontier. The area was popular with hipsters in the 60s and 70s, but eclipsed by DuPont Circle and Adams Morgan later-on. In its days as a port, Georgetown was far from affluent, other than the big houses “up the hill”. It was an industrial port city, a twin of sorts to Alexandria over in Virginia. It had immigrant Irish and German neighborhoods, as well as African-American neighborhoods (there’s still a Black baptist church there, although the local African-American population left with gentrification). it also had the first Jewish community in DC and there’s a historic synagogue there. 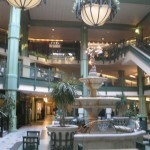 The mall has been in noticable decline since the mid-90s, with decreasing numbers of customers and ever less attractive tenants. Contrary to the weblink, FAO Schwartz was gone by 2001 and were numerous vacancies pre-2007, always replaced with ever more marginal tenants. 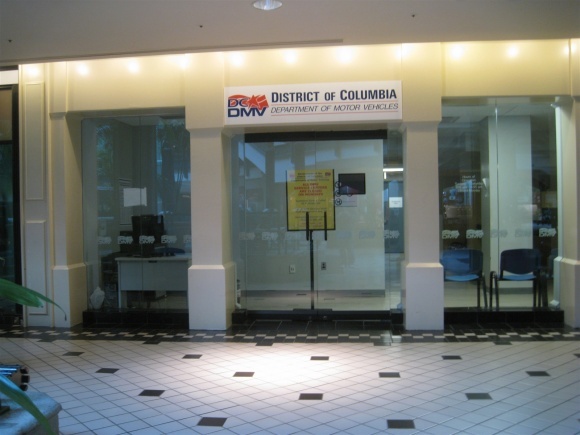 The DMV (a typical dead mall tenant) has been there since at least 2005. 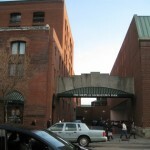 Besides Bloomie’s, Nordstrom repeatedly has been recruited as a tenant, although the location may have been too close their Pentagon City location. They were mentioned as long ago as the late 90s. 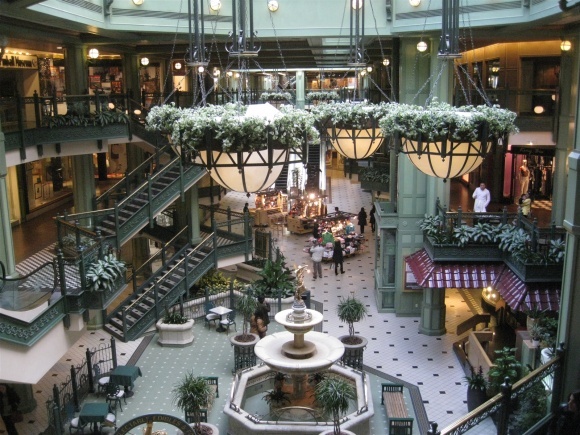 Georgetown is a good example of something that has occurred in numerous places like Michigan Ave (exc for water Tower) in Chicago, Old Town Pasadena, Santa Monica: the actual urban shopping district makes a big comeback, but the malls don’t. 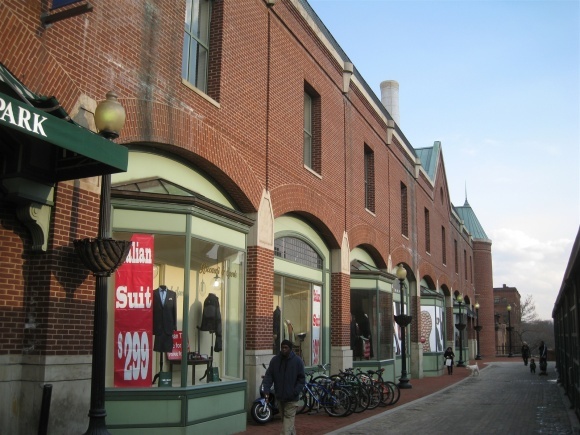 The Georgetown area had a big uptick in crime during the early/mid-90s, including violent crime, yet the streetscape continued to flourish and, later, previously empty or subpar spaces W of Georgetown Park became fully leased with upscale retail. 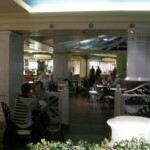 The mall itself is surrounded by class A tenants like Dean & DeLuca, Patagonia, etc. and has entrances convenient to its neighbors. It should do well , but hasn’t in many years. The 450K estimate probably includes the long departed Conran’s. When the Metro system was in the planning stages, they wanted to include a route to Georgetown, but the residents of the affluent neighborhood thought the subway would bring crime and would be seedy, not the technological marvel that it became. There is now a talk of trying to create a sixth line (color: purple?) that would run relatively along M Street NW, Massachusetts Avenue NW, H Streets NW and NE from Georgetown then up Bladensburg Road NE to Ft. Lincoln New Town (along the Maryland line near New York Avenue NE). I don’t believe this line is going to be built anytime soon, however you could speculate what the impact could have been since the line would have come close to this property. Another thing to consider, just west of Georgetown across the river is Arlington where you will find some of the areas wealthyest residents & it is a nothing trip by car, connector bus or train trip to Foggy Bottom. Foggy Bottom station is a short walk from Georgetown. Bringing in both Bloomingdale’s & Target makes a lot more sence than it may seme at first glance since Target is considered to be hip despite it being a discounter & it can be a good bookend for a Bloomingdale’s or similar high end retailer. @SEAN, The metro opposition is an urban myth. Metro planning occurred when the area still had a tannery and was viewed as somewhat “bohemian”. There were numerous engineering problems including the need to include a sharp curve in the road bed which would have made it awkward and expensive to tunnel under the Potomac at that point, whereas the Foggy Bottom to Rosslyn route posed fewer problems. Numerous proposals have been floated for a Metro line through Georgetown but none have ever materialized in part because of the cost of tunneling under the Potomac.Other than the Silver Line to Dulles (under construction), the only potential new line that’s on the books is the Purple Line which would connect New Carrollton in Prince George’s County with U of Maryland, Downtown Silver Spring and Downtown Bethesda and this has a numerous hurdles and is likely to be light rail rather than heavy rail like the rest of the Metro system. Foggy Bottom is a mile from the center of Georgetown and not exactly a short walk for most people, although Georgetown does attract students from GW. 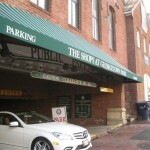 Parking is expensive and a chore in Georgetown which doesn’t make it very attractive to locals. Even the Connector is a headache because of the volume of vehicle traffic on M St. On busy weekends, the majority of shoppers are tourists, often from abroad. Arlington is far from being wealthy. For decades much of it has been dominated by military or airline employment and the housing stock is mostly modest interwar and early post-WWII bungalows and garden apartments. The lone exceptions are a few upscale residential neighborhoods in North Arlington adjacent to the much wealthier areas of Fairfax County. Arlington is much less expensive than DC and until intown real estate prices escalated, had a large population of Salvadoran and SE Asian immigrants who had been resettled there because of the low cost of rental property. Rosslyn (the section across from Georgetown) was a seedy prostitution stroll for decades and the urban renewal done largely in anticipation of the Metro is a monument to bad ideas from the 70s and lifeless outside of normal weekday hours. It’s better off than it used to be but is hardly wealthy. Arlington paid for burying the orange Line Metro underground and over the last 40 years had gradually redeveloped the entire corridor, which is more valuable than it used to be but hardly wealthy. People with money in DC or northern Virginia are much more connected geographically to Tyson’s Corner. As chains have taken over more space, Georgetown has lost much of what had made it unique in the DC area. 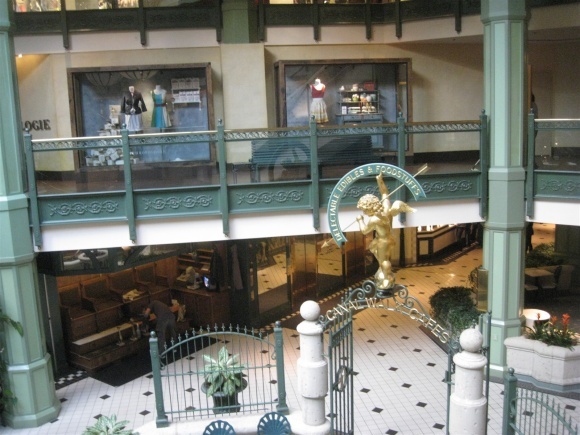 The galleries and antique shops mostly left in the late 80s/early 90s because of rising rents and those that remain are very upscale and in peripheral sections of the neighborhood. 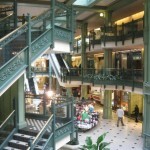 The area used to have two major art house cinemas, both of which have been converted to retail. I had absolutely no idea The Shops at Georgetown Park was on hard times! It’s a great little mall and it’s disappointing to see it in a sad state…hmm…maybe Vornado has something to do with that? At least there’s a solution and even though Bloomingdale’s can be easily accessed by Metro at White Flint, they’ll do fine in Georgetown, as will Target. The fact that it does not have easy Metro access could be a contributing factor to its downfall, but let’s be honest…there is NO WAY a Metro line will be built into Georgetown. That’s how the residents want it and many I know still feel the same. It looks like for now, they’ll have to rely on Rosslyn or Foggy Bottom. On a side note, a great litlte development in Georgetown is Washington Harbour. To me, it’s a more “modern design” as compared to Pier Village in Long Branch, NJ. If you’re in Georgetown, it’s worth a visit. @mallguy, why would a Metro make any difference to this mall? Everything around the mall has continued to thrive and this was true even in the mid-90s when Georgetown was having a crime wave. 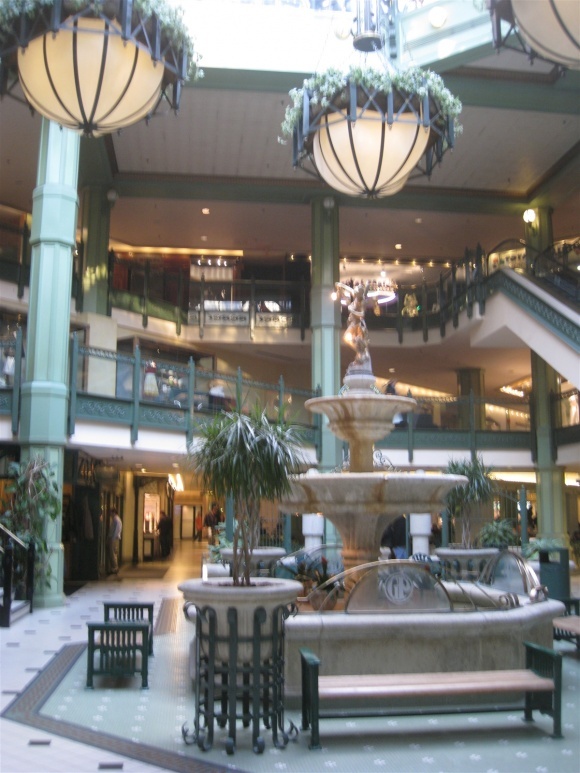 The mall has had a long decline and no longer serves its original function of bringing national retail chains into the area (they have plenty of representation all around it now). They were losing class A tenants 15 years ago. Bloomingdale’s also has a store on top of the Friendship Heights Metro stop, which actually isn’t that far away from Georgetown (a few miles up Wisconsin Ave). Friendship Heights is another area where the mall spaces have been dying for years but the streetside retail has been flourishing and growing. White Flint’s layout makes it somewhat inconvenient to the Metro and few people use it to get there. 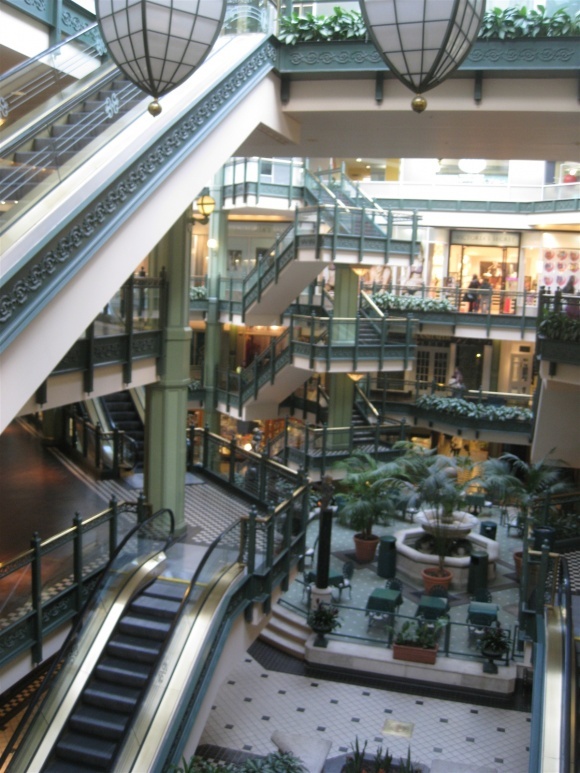 The mall itself has had a long decline. The area immediate to the Metro stop has been experiencing a series of mixed use developments. Interesting to see the line “… Unfortunately, the economy also collapsed about the same time..” in a story about a mall in Washington DC considering how that area is known by many to be, well “recession proof”. Similar to Austin, Dallas, Indianapolis, Raleigh, Charlotte and Martinsburg ( West Virginia )..all of whom claim to be “..what recession? Didn’t happen here baby !!” . ActuallY martinsburg and Indy kinda brags about it. @Cathy Jones, Vegas, don’t forget about Los Vegas on that list. DC has had a issue with crime, even it’s better neighborhoods like Georgetown are far from immune to it. Having said that, crime wasn’t the problem here, it was the reemergence of street activity plus disagreements by real estate intrests that hert this malls viability. I actually live less than a block away from this mall. It really serves no purpose in the area. 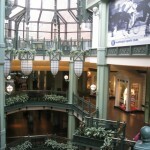 Georgetown, in and of itself, is like one big, multi-block mall. 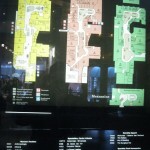 Making the mall an “anchor” is a great idea, although I question the Bloomies/Target split. The retail scene in Georgetown is dominated by M St and Wisc Ave. A lot of people don’t even know this mall exists because it is not very visible from the outside. 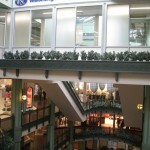 The lower levels of the mall especially are cut off from street traffic. Big boxing it sounds like a good idea, but I’m not sure if Target would fit in so well with all the upscale retailers in the surrounding area. I think the most successful business there is the DMV. That’s about the only thing I go there for. 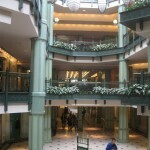 I haven’t shopped at this mall since the mid-1990s when I lived in Foggy Bottom. 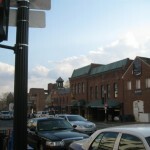 After I moved to Silver Spring, I continued to work downtown and stroll a mile to Georgetown periodically. But as far as I was concerned, there was no longer a compelling reason to walk the few extra blocks west of Wisconsin Avenue to the mall. If the mall had acquired any destination stores, they didn’t advertise this fact. 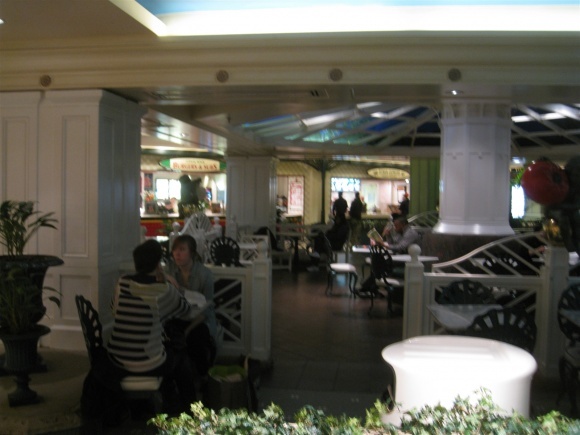 The exterior of the mall was non-descript and the interior was dated and depressing. 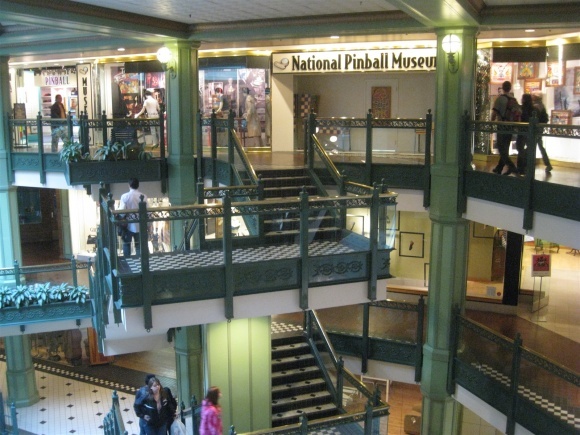 If I wanted to shop at an indoor mall, my natural inclination was to take Metro or my car to The Fashion Centre or Potomac Yards — not walk 30 blocks and cope with the difficulty of lugging goods home from multiple stores. Looking at the pictures on this page, I’m shocked that the interior decor of this upscale location hasn’t changed since then — in fact, I don’t think the interior has been updated since my first visit in the 1980s. 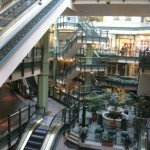 So it seems to me that the mall suffered from long-term underinvestment, not just an acute property-rights dispute. The idea of putting either a Target or Bloomingdale’s at this location is absurd, in my opinion. Both stores (Target, especially) typically require shoppers to have automobiles or subway access to transport their purchases to home or office. They tend not to attract local pedestrians or impulse buyers. Georgetown students and neighborhood residents might walk to the Target, but I don’t envision either store being able to draw sufficient tourists or city residents from outside the immediate neighborhood due to the site’s shortage of parking and Georgetown’s notorious traffic congestion. If the mall must survive (and I see no need for it) then it must make itself a compelling destination for pedestrians and tourists. 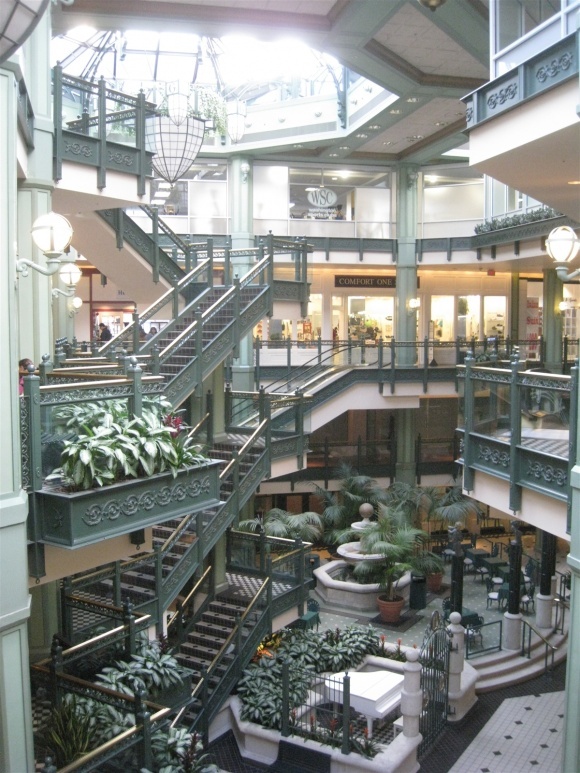 I think it makes much more sense to convert the mall into loft apartments or condos with ground-floor merchants. 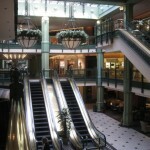 According to Yelp, the mall will close for “renovations” in 2011. Methinks these “renovations” will spare the streetside retail and possibly the food court but functionally replace the mall with Target and Bloomie’s. After reading this article and the comments, I have to say that a lot of it misses the mark. 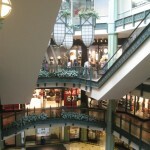 As a georgetown resident and local guy for quite some time, I know the area well and have seem this mall go downhill for some time. In fact, I would even say gtown is going downhill from an certain viewpoint. And why wouldn’t it? This city (and the apparently unwealthy arlington! Really?) have so many choices now. Downtown/Chinatown has a ton a great shopping now. 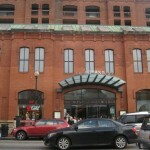 Our neighbors closer to U street have the anchor stores of Columbia Heights. Arlington has Pentagon Row. There is Mazza Galley up Wisconsin. 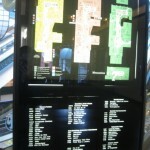 Why come to a dated mall with a bunch of stores no one has heard of? I don’t mean that offensively to the handful of decent stores in there, but why would the people that used to make the trip to georgetown really bother, esp when it convenient for many of them to metro or drive a shorter distance to get what they want? Or in fact, order on line? And that brings up another point. The internet. If I want something or want to shop at a specific store, I do what 90 percent of people that shop in georgetown do. I google for the nearest location. 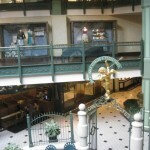 Would I have ever known there was a World Market a short trip of wisconsin in the bottom of a mall without it. Of course not! I went there for a table and in turn, paid for parking, bought a coffee and sandwich and grabbed a couple shirts while I was checking out a couple other stores. And I could have done the exact same thing in Pentagon City if they had my table in stock. So if its a Target, a Bloomies or even one of the cool smaller Best Buys like Fair Oaks mall (god forbid I buy something other than a Mac in georgetown!) , just get them in there. Do an interior renovation. Otherwise, it might as well just be a giant parking garage, an very deep swimming pool or a beer brewery. Just my thoughts. I’m a long-time DC resident and I remember tremendous opposition to a Georgetown subway by residents and retailers alike. At that time, Georgetown was a kind of DC Soho and had (or was developing) a retail panache unrivaled by any other area in DC with many unique upscale shops and restaurants. Things have changed. Georgetown now has lots of competition in DC and Tysons Corner has eclipsed it in panache. 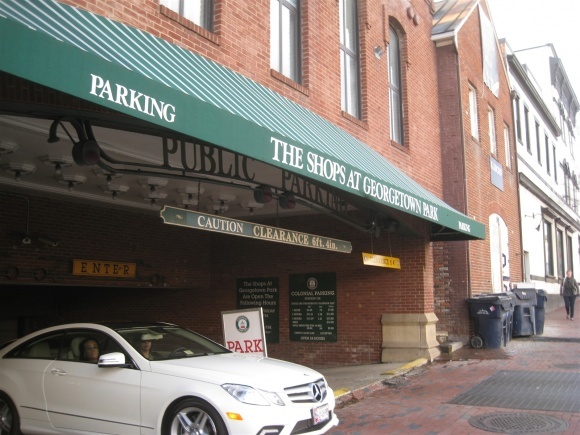 I simply have no reason to fight my way through Georgetown’s horrendous traffic congestion, pay high parking fees or search for a parking space a mile away from my destination and risk getting a parking ticket, when I can find the same store elsewhere with much less hassle or just buy online. The owners can put in a Target/Home Depot/K-Mart or turn it into a skateboard park or a giant latrine for all I care. Bit late to the convo here, but the Bloomies planned for the site was going to be way smaller than the one at Friendship Heights. A new format “urban” store, from what I heard (I had peripherally worked on something involving the redevelopment.) 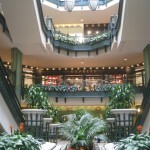 The interior of the mall is not trafficked, which is why the stores in there don’t do welll. I do remember it being moderately successful in the late 1990s when I moved to town, but only moderately. I had a friend that worked at the Talbots, and I remember the FAO Schwartz, but really, it was always a bit weird and haphazard. 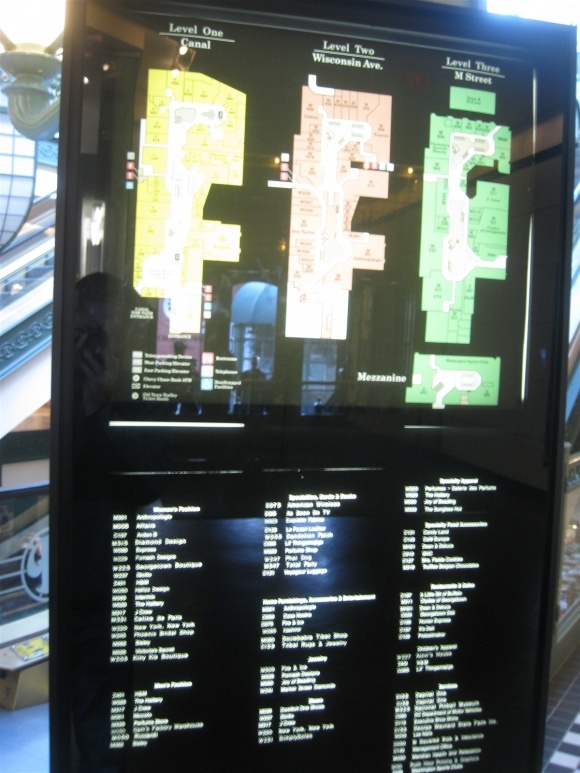 The way it’s designed makes it difficult to navigate, I think, especially if you just want to stroll and shop. 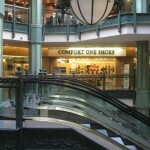 The foot traffic in there wasn’t anything compared to other area malls. 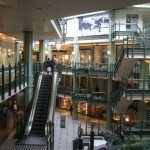 The hope is that by having two anchors, the inline retail has a better chance. As of now, only the street fronting stores have decent sales and rents. I think people shop in Georgetown for the environment, not the shopping, unless it is something unique to the area, so going inside is a bit missing the point. I personally avoid Georgetown like the plague and only go there a few times a year at most, and I live in DC. Usually, I go to a restaurant, and maybe go to a store or two, but don’t do major shopping there. I had to laugh at the unwealthy Arlington comment-there are areas away from the metro that have concentrations of immigrant populations, but I’d say on the whole it’s pretty affluent, especially on the Orange line. All I know is that I couldn’t hope to afford to live there, and I make a decent salary. @Plangal, to that point, here’s an article from the Wash Post. The Washington area had the lowest shopping center vacancy rate among large metropolitan areas at the end of the second quarter of 2012. 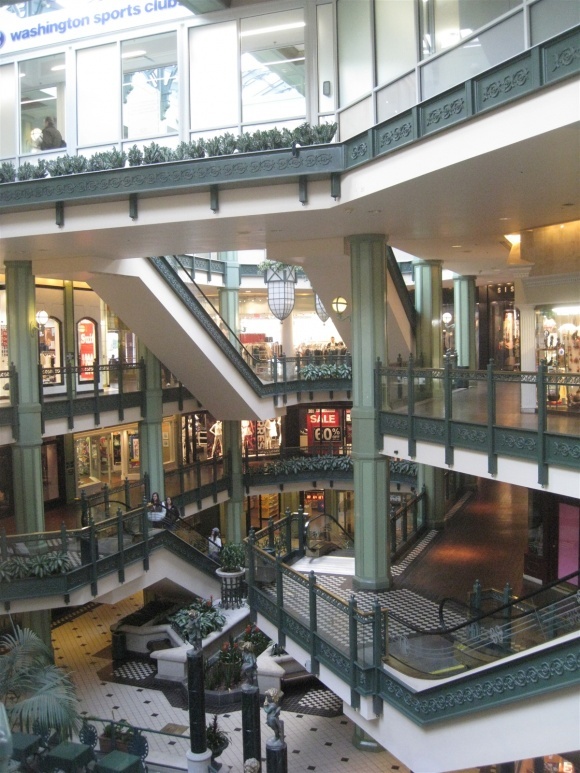 The overall vacancy rate for all types of shopping centers is 5.3 percent in the Washington area, down from 5.6 percent one year ago, and far lower than the national rate of 9.2 percent in June. With low vacancy rates and the highest median household income in the United States, the Washington area is attracting new retail development. Many of the significant new projects are grocery-anchored centers or of a mixed-use nature. 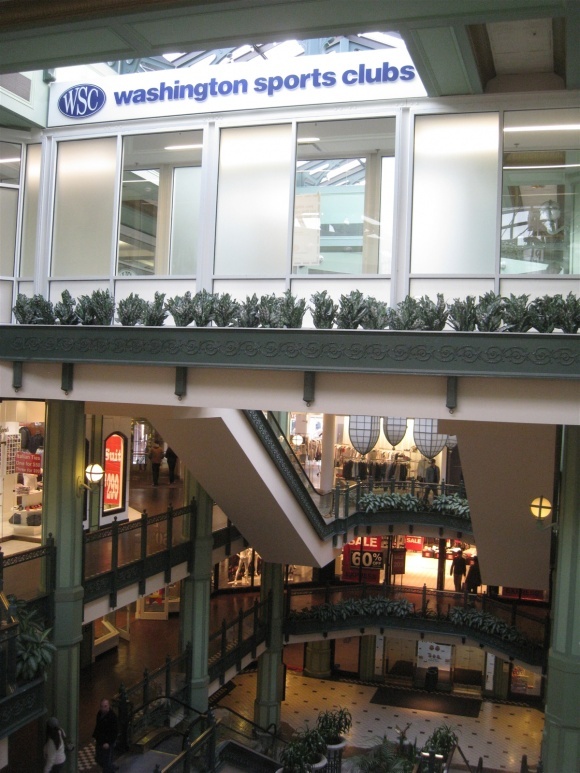 They will fill a need in the market; 56 percent of the Washington area’s shopping center square footage is more than 25 years old, and larger tenants often are seeking newer space. There were nine major grocery-anchored shopping centers, totaling 2.2 million square feet, under construction or renovation in the region in July. The first phase of the Mosaic District in Merrifield is set to deliver 350,000 square feet of retail space by September. The project will include My Organic Market. JBG Cos. and Bozzuto plan to break ground on Downtown Crown, a mixed-use town center in Montgomery County. The project is to include 540 apartments and 260,000 square feet of retail, anchored by a Harris Teeter grocery. Bozzuto and Southside Investment Partners are redeveloping a Giant Food store along Wisconsin Avenue near the National Cathedral in the District. The project, Cathedral Commons, is to include 128,000 square feet of retail, a 56,000-square-foot Giant Food store, 137 apartments and eight town homes. Ground work has started on a multifamily project along St. Asaph Street in Old Town Alexandria for a 175-unit apartment building with a Harris Teeter located on the ground floor. The Rosenthal Chrysler Jeep dealership at 3400 Columbia Pike in Arlington County has shuttered, and the site is to be transformed into a multifamily complex with ground floor retail. McCaffrey Interests is planning a 166-unit multifamily project along Lee Highway in Arlington County, which is to include a My Organic Market on the first floor. We expect the vacancy rate for shopping centers to decline during the balance of 2012, as new retailers enter the market and existing retailers look to expand. In particular, national tenants are focused on close-in, higher-end centers. Shopping centers with notable vacancies may have a hard time attracting new tenants, unless the property is located in a top-performing neighborhood or the center undergoes renovations. 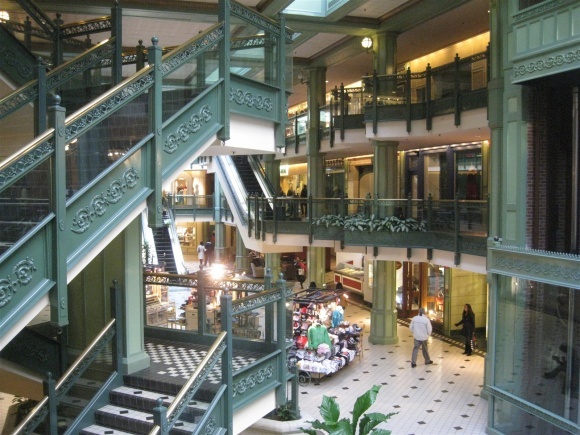 Given demand for Class A space, we believe property owners will continue to invest, where the cash is available, in repositioning existing, underperforming assets — either upgrading or transforming those shopping centers. 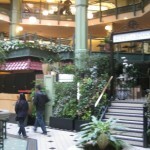 Currently, tenants seeking space are most interested in newer, Class A space with significant foot traffic. Of note, centers that focus on everyday needs, such as groceries and other necessities, remain successful during economic downturns or slow-growth periods. The current economic expansion cycle in Washington is likely to be a muted one, given concern over federal budget cuts. 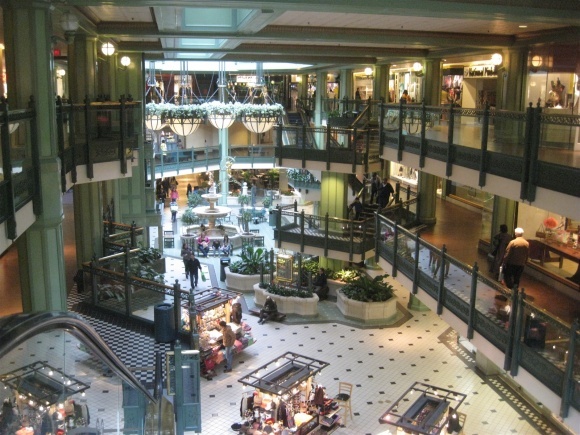 Given the long-term demand for retail goods in this area, we believe developers will look to continue to develop new retail space at least until 2013-14. Sandy Paul is the national research director at Delta Associates. Staff at Delta Associates contributed to this article. 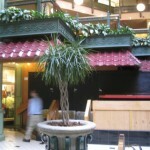 For more information, please visit http://www.deltaassociates.com. The Traget in Columbia Heights does quite well with walkers and public transit users. the huge garage that the developers wanted mostly goes unused. 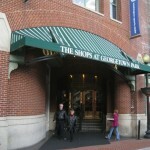 The Georgetown store does not need parking (which the mall already has in abundance). 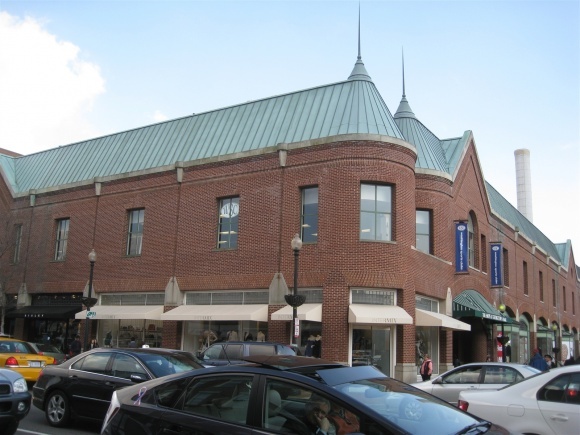 Ditto Bloomie’s which will probablysell merchanides unlike the many specialty stores in the area.Most of Arlington remains much less expensive than desirable intown areas of DC like Logan Circle, etc.. Bloomies’s will do ok if they figure out what the tourist trade wants. Target will fill the need for stores selling useful things that have been priced out of the area over the last 30 years. It will be popular with people from Rosslyn and neighborhoods above Gtown along Wisconsin Ave, as well as students from GW and people in Dupont. FWIW, the interior of Georgetown Park is no more, having been partitioned into various big boxes facing the edges of the building, including M Street. Target backed out amidst the recession, and Bloomingdales didn’t get a subsidy so also walked, leaving an odd-bedfellows tenant mix, including TJMaxx, J. Crew, and a Pinstripes bowling alley. 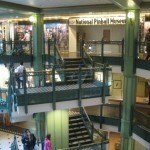 I caught a bit of the old interior above the cash registers in the newly expanded H&M. 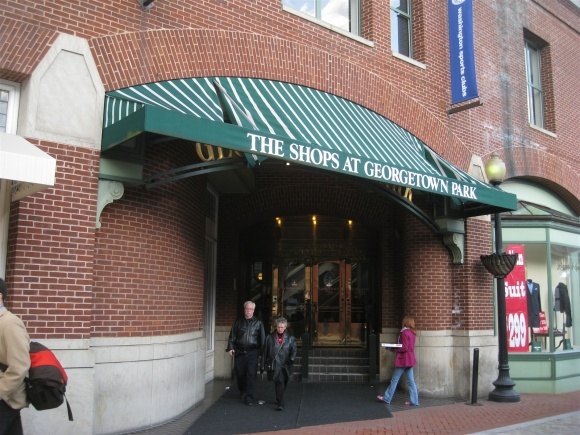 Georgetown has a particularly invasive historic building review process, and evidently one of the results was that the mall had very little signage.